Adorable! Bought these for my daughter. She loves them! I bought these for my 70yo mum for Chrissy - the blue wren is her favourite bird and we have plenty of them in the area we live. The earrings are just gorgeous & I'm so happy with them. They are quaint and unique and i know she'll love them too. Love that they are Aussie designed & made too :) ...might have to buy myself a pair! These are the cutest little earrings!!! So fun to wear. I see willy wagtails in my area. These are so Australian. I would like to see the kangaroo and koala in hanging earrings too. Well made. 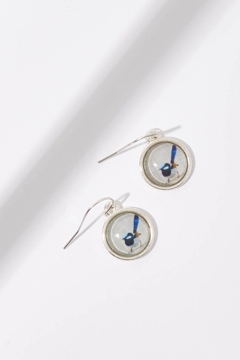 These earrings are really cute, and are just the right size - not too big (or too heavy) and not so small you can't see the birds. My most favourite earrings of all time!!!! Get so many compliments when I wear them. Even my 3 years old granddaughter asks "where's your birdie earrings" when I don't wear them. This are delightful. I always get compliments when I wear them.